Grains/Inch: 250 = 8.11, 350 = 9.07"
Spine: 250 = 0.417", 350 = 0.342"
Diameter: 250 = 0.295", 350 = 0.300"
Managing how an arrow flexes in flight (Dynamic Spine) is the key to arrow accuracy, and this is what Carbon Express® specializes in. The new Maxima® RED™ is a breakthrough in controlling Dynamic Spine. The new, hi-tech carbon design has stiffer ends to contain the arrow’s flex to what they call the “RED ZONE”™. The RED ZONE™ is the section of the arrow shaft engineered to contain Dynamic Spine and make a broadhead shoot more consistently. Containing arrow flex to the RED ZONE™ provides a new level of hunting performance because broadheads exaggerate the effect of arrow flexing in flight and act like “wings” on the front of the arrow. 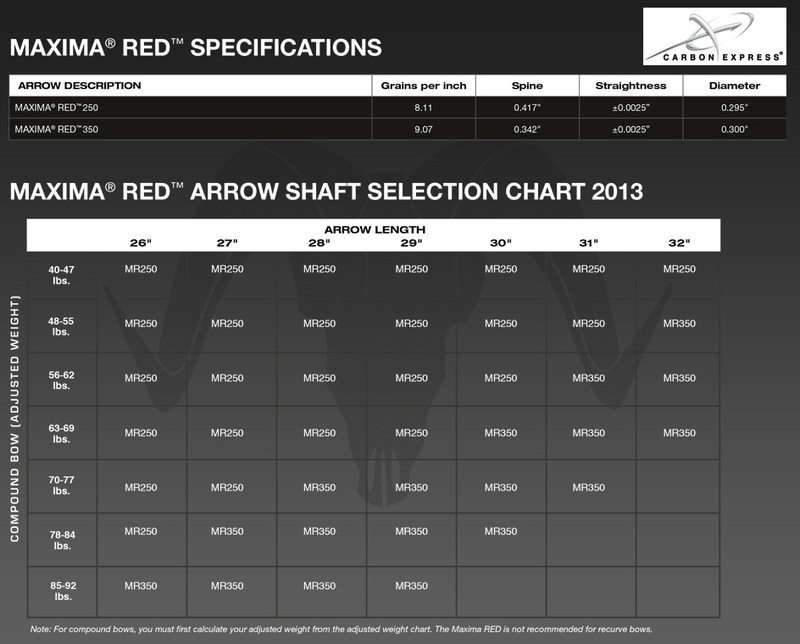 By reducing arrow flex in the front of the shaft, the Maxima® RED™ makes broadheads shoot tighter groups and provides overall improved hunting performance. Contain the enemy of accuracy with The New Maxima® RED™.